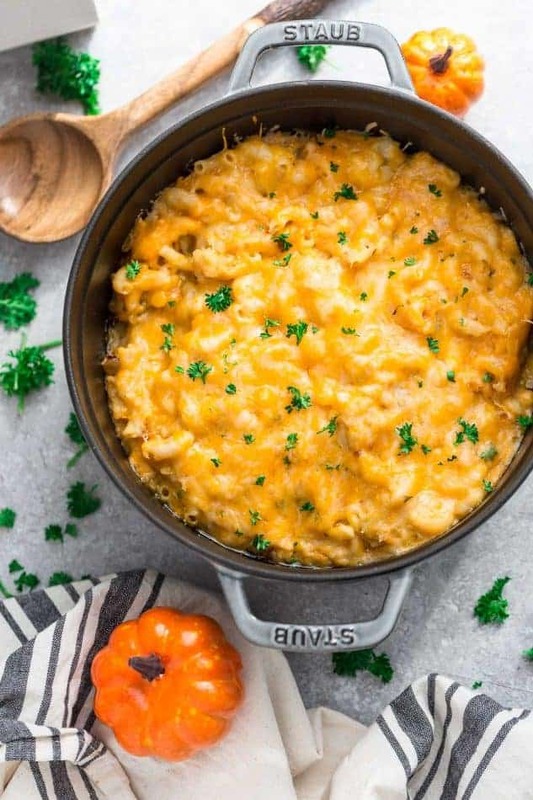 Pumpkin Stovetop Macaroni & Cheese -the perfect comforting one-pot dish for fall. Best of all, loaded with 3 cheeses and so easy to make in less than 30 minutes. Plus recipe video. It’s comfort food season and I can’t think of anything more comforting than a creamy bowl of macaroni & cheese. It’s the ultimate comfort food and making it from scratch doesn’t take much more effort than that stuff that comes in the blue box. Once the cooler temps hit, we alternate between this stovetop version and one pot version quite a bit. 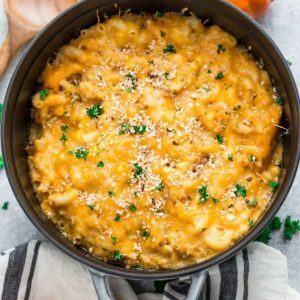 And now this Pumpkin Stovetop Macaroni & Cheese is our latest favorite for fall. It’s the perfect solution to those busy weeknights. And the best part is, it’s super simple to whip up and comes together in about 30 minutes! Plus the hint of warm spices like nutmeg and cayenne pepper make this so warming for the chillier months. You just start off by boiling your favorite elbow macaroni or small shell pasta a big-heavy bottomed pot. Once you rinse and drained the pasta, combine the other ingredients together in that same pot. Feel free to use a mixture of your favorite cheeses. 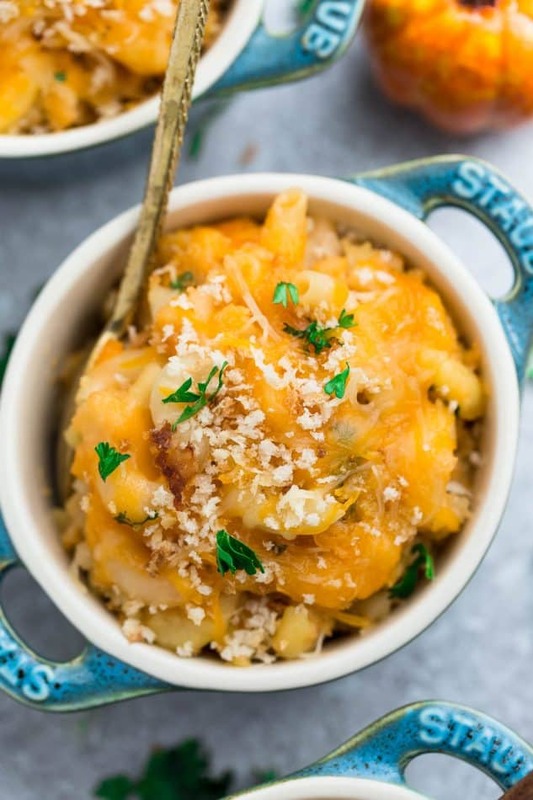 I love sneaking in a good dose of pumpkin & combining it with sharp cheddar, cream cheese and mozzarella for that wonderful creaminess. Gruyere, Swiss, Montery Jack, gouda, Parmesan, Asiago or Pecorino would also be great! Finally, sprinkle some toasted panko crumbs and more cheddar cheese and dig in. If you like an extra crunchy baked topping, you can toss the pot into the oven, and bake or broil for a few minutes. 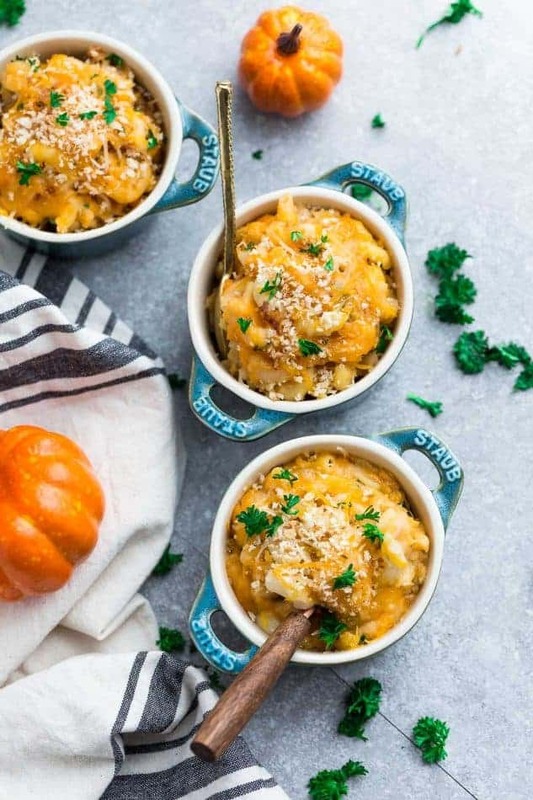 Cheesy, creamy and the ultimate comfort dish for fall. 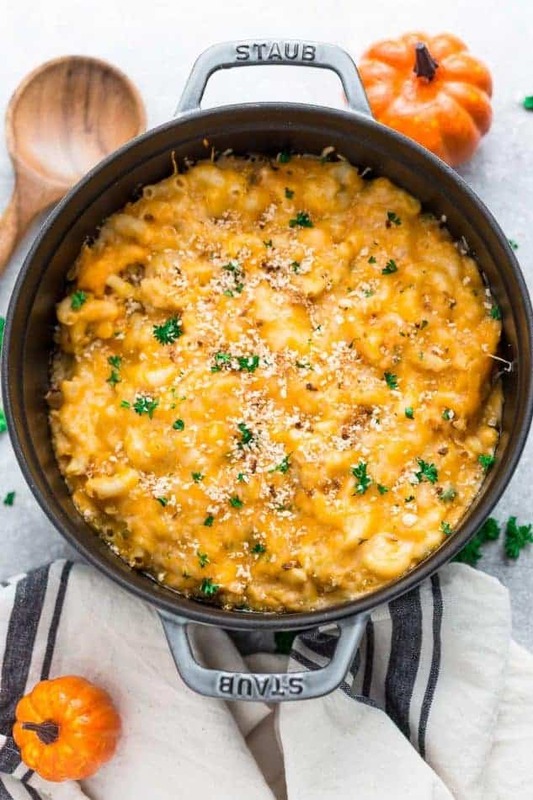 Pumpkin Stovetop Macaroni & Cheese makes the perfect comforting dish. Easy to make in less than 30 minutes and full cozy fall flavors. 2 2/3 cups dry elbow macaroni or any other fun shape works too! Fill a large heavy-bottomed (oven-safe if broiling) pot to a boil on the stove. Add in pasta and cook for about 6 minutes or until just al dente. Drain and set aside. Bring the same pot back to the stove on medium low heat, melt butter and whisk in flour creating a roux. Whisk constantly, until a smooth slurry forms - about 1 -2 minutes. Slowly pour in milk and continue to whisk until smooth and creamy. Whisk in nutmeg, mustard, garlic powder, salt, pepper, and cayenne pepper. Add pumpkin and cheeses and stir until sauce forms and thickens. Taste and adjust seasonings with salt or black pepper as needed. Once cheese sauce is smooth, add the cooked macaroni and toss to coat. Remove from heat. Add more milk or cheese as needed for the consistency desired. Sprinkle with reserved cheese, chopped parsley and toasted panko crumbs. For an extra crunchy-topping, place (oven-safe pot) under the broiler for 2 minutes. (You an also cover with foil and bake in a preheated 350 F oven for 20 minutes). Recipe is best warm and fresh, but will keep airtight in the fridge for up to 5 days or in the freezer for 3 months. Reheat on low heat prior to serving leftovers so cheese doesn't separate and add milk as needed to desired creamy consistency. This looks and sounds delicious! I’m covered in a toddler right now! In fact, that’s a big reason why I am not gotten almost done for Christmas! I need to get going. I haven’t made mac & cheese in a while! I need to fix that – I love that this version has pumpkin in it!! I would love a bowl right now! 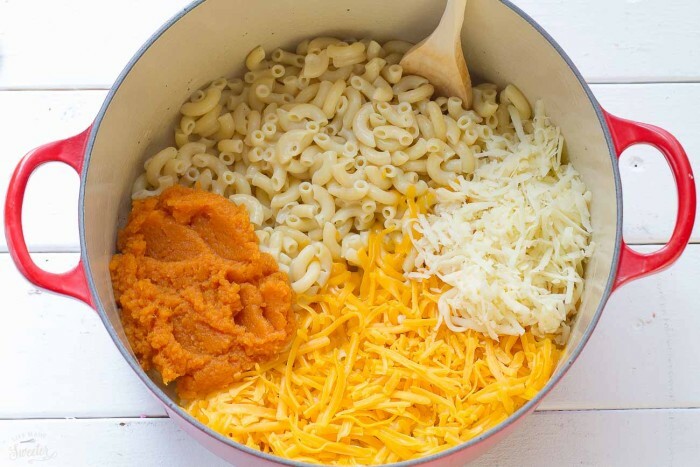 Your mac & cheese looks delicious and adding pumpkin to this is perfect. Love this Kelly! Mac & cheese is the ultimate comfort food. Adding pumpkin is such a great idea! Looks fantastic! Looks way too delicious! I love the pumpkin! 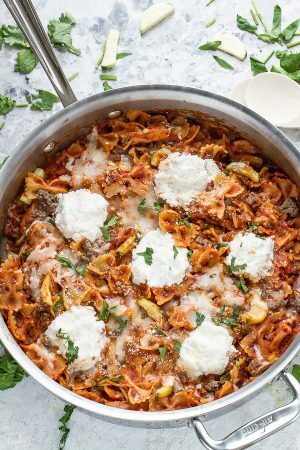 This dish is perfect for those busy nights! Love the pumpkin! Looks delicious, Kelly! I love how easy it is to make too! I can never get enough of easy dishes this time of year! Looks delicious! Have a great weekend, Kelly! 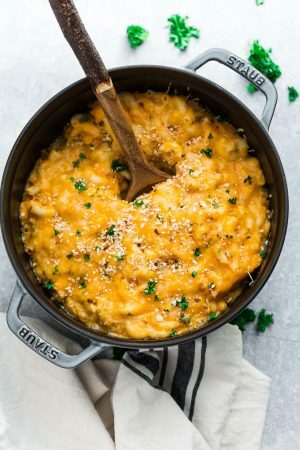 This is the perfect comfort dish for fall! Looks so good! What an awesome looking dish & it is so easy to make! Kelly – this is a brilliant! Kelly, this looks so amazing! Love the pumpkin in here and that you made it on the stove! This would be perfect for busy weeknights!